I am referring to the CEO Cafe, not your off-the-supermarket-shelf stuff. Coffee is known for its rich content of phenol compounds, which are powerful antioxidants capable of retarding the speed with which "bad" LDL cholesterol is oxidized by up to 3 times, in addition to dissolving blood clots and discouraging the formation of thrombi. Furthermore, coffee has an amazing effect in improving vascular constriction to prevent the onset of headache as a result of vascular dilation in the brain. As CEO Cafe is enhanced with Yung Kien Ganoderma (Lingzhi) extract, it plays an amazing role in relieving migraine. Click here to find out How Lingzhi Works in Our Body. Coffee also helps promote blood circulation and removes fatigue. Not only is coffee good for our health, it helps with the beauty aspect too. Caffeine is capable of increasing the rate of caloric expenditure in the human body. 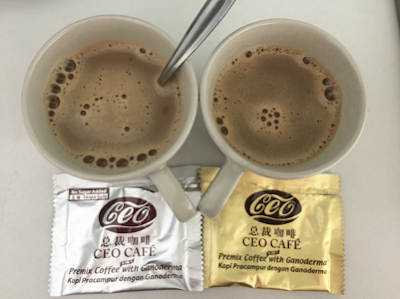 Research findings have shown that consuming 1 cup of CEO Cafe is good enough to breakdown the fat content in the food, elevate the body's metabolic rate by 3%-4%, and increase caloric expenditure. So to the coffee lovers out there - great news - indulge in your "addiction" and keep your weight in check at the same time. Thirsty? Email me at askfuiping@gmail.com to quench your thirst with CEO Cafe Coffee. Click here to refer to Shuang Hor company website for Product Description and Price.